As I recovered, I realized that my whole life had been out of balance…I had graduated high school at 16, and had been working nonstop since then, first as a waitress, then as a restaurant manager. I had been obsessed by my career, success, and material things. The crash woke me up to the importance of the moment, and doing whatever I could to make a positive impact on the future.The steering wheel in my head, both figuratively and literally, steered me in a new direction in my life. Volunteering to work with fundraisers protesting to save the redwood forests in California, in 197, Hill was selected to stay on a tree for a week. She climbed on that luna tree and lived on two 6-by-6-foot platforms for 738 (two years and eight days) weathering freezing rain and the onslaught of the El Nino winds! She faced all manner of harassment from the stooges of the lumber bosses, but she stayed until a satisfactory agreement was reached to preserve the trees. Today, I’d like to reflect on what my tree is and what I will do to preserve it. #MondayMusings has now officially shifted over from Write Tribe to Everyday Gyaan. 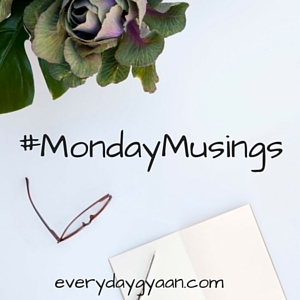 I am happy to co-host today’s #MondayMusings with Shalini of Tale of Two Tomatoes. Please visit and comment on her post too. Very thought-provoking post, Corinne! What a wonderful idea, comparing oneself to a tree…great starting point for many of us. You’re so right, Payal. Openness is the key! But, what an inspiring post! It is difficult to find one’s purpose in life. I wish I find mine sooner or later. I understand, Shalini. Mine keeps going off and on all day long. I guess we all must keep our ear to the ground to find our purpose. I guess it is not tough finding a purpose but living with it with all soul and heart is tough. Kudos to her. It is an inspiration for often we leave things midway whatever be the reason. You’re right, Ira. Plunging headlong into something and giving it our all takes a lot of conviction and commitment. 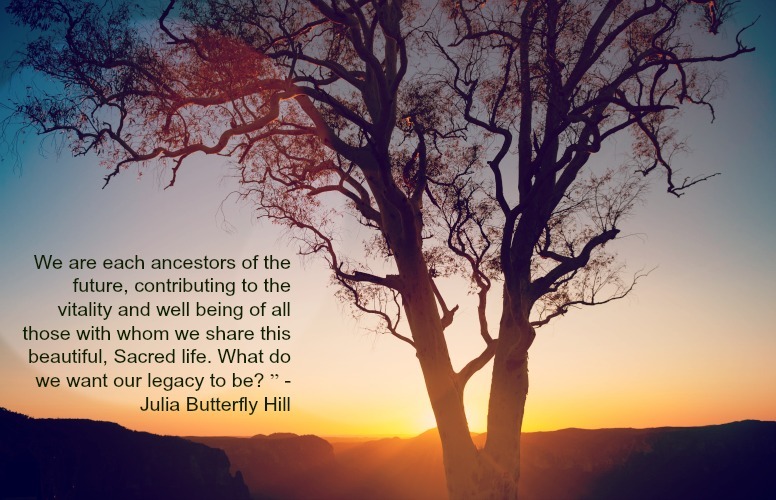 What a beautiful concept…she puts it so simply…find your purpose, your community and then take inspired action. I am working towards this. Thanks for a lovely, thought provoking post! I’m glad this spoke to you, Aditi. I’m attempting to do the same. I found this story inspiring. We forget that things like National Parks were not always there for us but rather through the efforts of visionaries that went before us. Her quotes rings in optimism. No matter how much we hate pain, it defines our lives and I am sure one day we will be thankful. Very inspiring. It amazes me how the lowest times of our lives inspire us to greatness and to better understanding more than anything else. She is an amazing woman. I first learned of her years ago and thought, now here’s a woman who lives her values. Life’s hard times tell us to find our purpose. It’s amazing how that is but it happens. Inspiring! Thanks for sharing Corinne. Corinne, that quote is so powerful! Thank you for sharing a truly inspiring story … today, I will try to recite the words, “I am just a thought away from having a magical life beyond belief.” So beautiful. Thank you! So what is your tree Corinne? I love the idea of comparing yourself to a tree. The trauma of cancer moved me from being an RN to being a published author. The first book I had published was a book of meditations based on my experiences during cancer. My surgeon anticipated my life expectancy to be less than a year. I’m still here. That was in 1997! I’m grateful for all I went through because it showed me there was more to life than I was living. That’s amazing! Best wishes to you. Still I am looking on the purpose of my life. But it keeps on moving. Wonderful post, Corinne. I guess we all are, Vasantha. Good luck with finding yours. I’m sure that living a happy life does count – if you’re happy you make others around you happy too, no? Don’t worry. Trust in the Universe – it speaks louder than we realize! Yes they are, Shilpa and yet, we fight against all manner of suffering, don’t we? I’m glad you found this inspiring, I know, I did. Yes, it’s amazing how we can also allow pain to move us out of our comfort zones and take on something we’ve been afraid of doing.